Vantage Goldfields Limited (“Vantage”, “the Company” or the Group) is engaged in the mining and exploration of gold in the Barberton Greenstone Belt of South Africa, a well-developed region with established infrastructure. The Barberton Goldfield is the second largest in South Africa, second only to the Witwatersrand Basin, which is the world's most prolific source of gold. The Barberton Goldfield has produced continuously for more than a century from multi-million ounce gold deposits. The Barberton Greenstone Belt is geologically analogous to the Zimbabwean greenstones which have collectively produced more gold per square kilometre than any other of its kind in the world, including other globally significant greenstone belts such as the Norseman Wiluna Greenstone Belt (which hosts many Western Australian gold deposits, including the Kalgoorlie Golden Mile), and Canada’s large Abitibi Greenstone Belt. The Company’s key properties have access to all necessary infrastructure to support current exploration and mining activities. Access by tarred roads is principally via the N4 national highway and R38 and R40 regional routes. The Barberton region is also serviced by a railway link from Kaapmuiden to the main Johannesburg – Maputo line. Vantage’s regional offices are situated in Nelspruit, the provincial capital, located approximately 25 km from the Kruger Mpumalanga International Airport. The Company’s mining rights cover the Lily Mine and Barbrook Mines Complex (including the Taylors Mine). Its prospecting rights cover some 16,000 ha of greenstone terrain containing known gold deposits and other exploration targets. 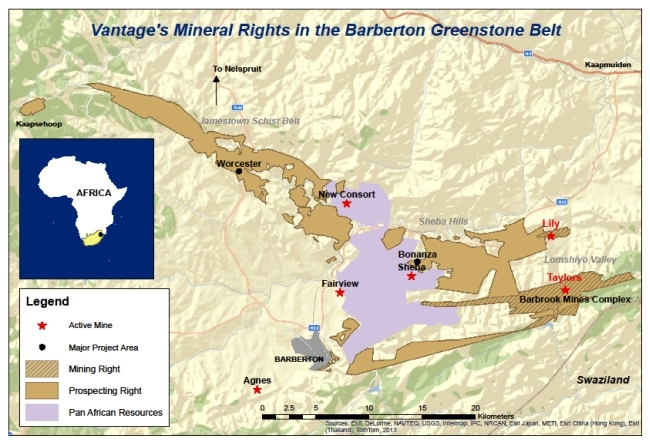 These mineral rights surround the central core of the Barberton Goldfield where Pan African Resources plc currently produces some 100,000 oz/annum from three mines (Sheba, Fairview, New Consort).